Rob Cesternino and Akiva Wienerkur didn’t need to fast for three days, so they got some Drake’s coffee cake and sat down to discuss the latest episode in their run through the entire Seinfeld series. 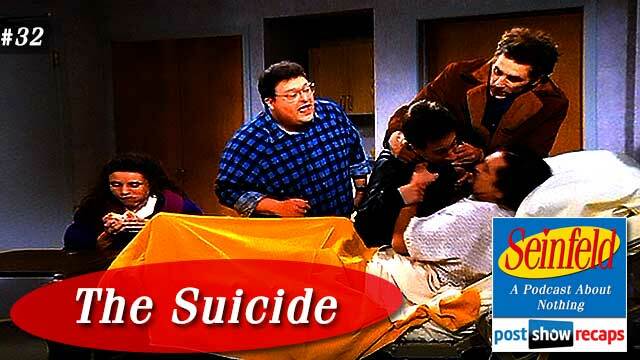 This week’s episode was “The Suicide”, which first aired January 29, 1992. There was only some sad news in the Seinfeld universe this week, as Taylor Negron, a recognizable character actor and a guest star in “The Smelly Car”, died from cancer. Rob and Akiva both felt it was time to come up with a nicer phrase than “fun fact” for actors who have passed away, and will now go with “visiting the alternate side” or “eating at Reggie’s Diner”. They wasted no time jumping right into the episode. Jerry’s opening standup is a bit about having a physical that loosely tied into the Elaine storyline of the episode. The episode opens with Jerry walking his garbage down the hallway, where he sees George, and promptly asks him to take the garbage down for him. George quickly says he’ll do it, but for two bucks. When George won’t take 50 cents for the job, Jerry leaves the garbage bag at Kramer’s door. Before going back in Jerry’s apartment, the girlfriend of Jerry’s other neighbor comes out, leading to a flirting exchange about Drake’s coffee cake. When her boyfriend comes out, he seems very annoyed that Jerry is talking to his girlfriend Gina. George shares that he’s going on vacation to the Cayman Islands, even though he has no job. He also tells Jerry about a dream he had where he was doing standup. After describing the dream in great detail, Elaine suggests that George go to a psychic she knows to help interpret it. Elaine meanwhile, is having to fast for the next three days for a test to determine if she has ulcers. There is a knock at Jerry’s door, and it’s Gina, who tells them that her boyfriend Martin has tried to kill himself and is in the hospital. The next scene is Jerry with Gina at the hospital visiting Martin, who’s in a coma. Gina shares with Jerry that Martin was jealous of Jerry, and for good reason because she thinks about Jerry a lot. Throughout the visit, she tries to hook up with him right in front of Martin in the coma. Rob felt that Gina is a drama seeker, trying to get caught for the excitement of it. When Jerry resists her passes, she questions his manhood, but he “respects the coma”, and won’t do it. When Kramer learns Martin is in a coma, he is worried because Martin has his vacuum. He goes as far to suggest that it should be Dr. Kevorkian time for Martin. 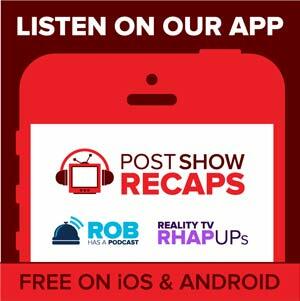 Rob and Akiva discussed how the loose talk about suicide throughout the episode might not be so politically correct in 2015. In the next scene, George and Elaine are at the psychic’s house. She is nine month’s pregnant and smoking cigarettes, which Elaine takes issue with. The psychic intrigues George by knowing about George’s ex girlfriend Audrey and her nose. Because of this, George is worried when she shares a vision of trouble for him on his upcoming vacation. Elaine can’t let go the fact this pregnant psychic is smoking, which causes them to be kicked out before George can find out what will go wrong on his trip. There is another Jerry standup bit mid episode about psychics. Akiva and Rob take some time to talk about psychics getting official licenses, and how that might help their validity. Back to the episode, Gina is in Jerry’s apartment, where she has used his toothbrush. Akiva was certain that the germ freak Jerry would be throwing that toothbrush out right away. As Jerry and Gina go to leave, he is worried to walk together, since Newman, who is friend’s with Martin, might spot them and spill the story. She again questions his manhood, so they walk out together, only to bump into Newman coming out of Kramer’s apartment. The first interaction with Jerry and Newman has the classic, “hello Jerry, hello Newman”. Akiva remarked that the Newman character burst on the Seinfeld scene fully formed. Jerry, George and Elaine are all at the hospital again. George is still fretting about the Cayman Islands trip, and Elaine is increasingly going crazy from fasting for three days. Kramer and Newman are in Martin’s room, and Kramer gets in Martin’s face, yelling at him for his vacuum back, even though Martin is still in a coma. When Jerry comes in, he tries to convince Newman to not say anything about he and Gina. He had even brought an extra coffee cake to bribe Newman with. When the starved Elaine steals the coffee cake from Newman, the ruckus wakes up Martin, and Newman gives up Jerry. Still at the hospital, George notices the psychic in the delivery room when walking down the hall, so he follows her to try and find out about the trouble on his trip, but he doesn’t get an answer. In the next scene back at Jerry’s apartment, George shares how he had to help deliver the psychic’s baby. Kramer comes in, fresh from his trip to the Cayman Islands, where he shares that Sports Illustrated was shooting the swimsuit issue at his hotel. He did step on a jellyfish, which George assumes was the bad thing that could have happened to him while there. Jerry’s final standup is a bit about how people who try suicide and fail should keep trying, so they’ll be successful at something. Rob felt that Jerry wouldn’t do this joke nowadays, considering it very flip and dark. If this episode took place in 2015, there would only be a few differences. Rob felt that the pregnant smoking psychic would generate a lot more ire, while Akiva felt that George would ask for more than two dollars to take out the trash. Akiva didn’t hold this episode in high regard, as he placed it at 151 on his list, between “The Tape” and “The Jacket”. Both Rob and Akiva agreed it was a weak episode, but the introduction of Newman was a bit of a saving grace. There were a few emails this week. Johnny De Silveira was back and asked Rob and Akiva if they ever dreamt anything that later came true. Akiva had a class where he was supposed to document his dreams, but he’s fairly certain he blew off the assignment, so he can’t be sure. Mark emailed wondering why Martin and Gina would invite Jerry to their housewarming party at the end of the episode, since Jerry made out with Gina while Martin was in a coma. Akiva and Rob both agreed this was a bad idea. Chester wants to know why Jerry didn’t make a Yom Kippur joke when Elaine asked him about fasting. Akiva assumed that it was probably due to NBC always trying to make the show “less Jewish”. He also wanted to know why Elaine the vegetarian would be dreaming about eating duck. Akiva felt that while fasting, anyone would bend any boundary just to eat.